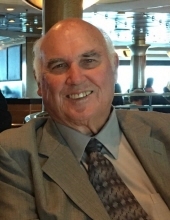 Jerry Randolph Bourg, age 75 passed away in Orlando, FL surrounded by his immediate family on the morning of Saturday, March 30, 2019. Jerry was born in Yazoo City, Mississippi and attended Louisiana College and Southern Mississippi where he played football and earned a BS degree in Physical Education. Jerry was a Physical Education teacher and coach at Walker Junior High School until he transferred to Colonial High School in 1987 to teach Driver’s Ed and was the Asst. Athletic Director. In 1990, he opened University High School as the Athletic Director and Driver’s Ed teacher and retired in 2005. Jerry loved to play golf with his friends, bowl, and there wasn’t a sport he didn’t watch on TV. He especially enjoyed watching ballgames in the evenings. From coloring, to playdoh to fishing, he never missed a chance to spend time with his grandchildren. He loved North Carolina in the fall and he and Marilyn spent numerous years travelling there to see the leaves change. Jerry was a kind, gentle, selfless man. He always put others’ needs first. He had a sweet smile and gentle soul. Jerry was loved by all who knew him. Jerry is survived by his wife of 51 years, Marilyn; son, Keith (Shari); daughter, Amy (Michael Sica); grandchildren, Josh, Brandon, Sophia & Scarlett. To send flowers or a remembrance gift to the family of Jerry Randolph Bourg, please visit our Tribute Store. Guaranteed delivery before Jerry's service begins. "Email Address" would like to share the life celebration of Jerry Randolph Bourg. Click on the "link" to go to share a favorite memory or leave a condolence message for the family.